Free continental breakfast complimentary Wi-Fi a seasonal outdoor pool and Fort Jackson three miles south are good news for guests at La Quinta Inn & Suites Columbia Northeast Fort Jackson which also offers free parking. 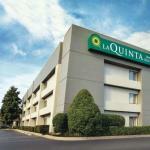 The three-floor La Quinta has 99 rooms all with free Wi-Fi microwaves mini-fridges coffee/tea makers and premium cable TV. Lick your lips and head for the free continental breakfast of waffles or French toast pastries hot and cold cereal bread muffins hard-boiled eggs fresh fruit yogurt coffee and juice. Our guests enjoy basking in the sun by the seasonal outdoor pool. The hotel also has a laundry facility and free parking. The hotel is in northeast Columbia in Dentsville two miles northeast of Columbia Mall Shopping Center. The northwest section of Fort Jackson is three miles south of the hotel. The city center of Columbia with the State House University of South Carolina Town Theatre and EdVenture is about nine miles southwest of the hotel. If you're driving from Columbia Metropolitan Airport the hotel is 15 miles northeast. Dogs of all sizes are allowed. There are no additional pet fees. Dogs must be crated if left alone in the room. Dogs are not allowed in the breakfast area, and they must be leashed and cleaned up after.